Known for commissioning new music, high-quality and passionate singing, tackling difficult and rarely performed music as well as much-loved and well-known pieces, Hertfordshire Chorus is one of the UK’s finest symphonic choirs. The choir performs regularly in the UK’s major concert halls, appears frequently with the BBC Concert Orchestra and with the Royal Philharmonic Concert Orchestra, has worked with Daniele Gatti and José Carreras and has made numerous recordings. Its members sing regularly in other concerts, including the BBC Proms. David Temple, one of the leading choral conductors in the country, has been its Musical Director since 2000. The Chorus has a special fund to commission new music and under David Temple’s direction its drive to encourage young British composers has produced some of the most outstanding and successful new choral music of recent times, including Will Todd’s Mass in Blue, with pieces being performed by choirs around the world. The Chorus is particularly proud of the work it does with children and young people to help encourage the next generation of choral singers and music enthusiasts. 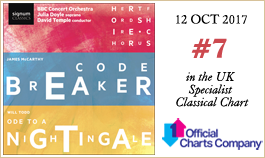 Ode to a Nightingale (by Will Todd) and Codebreaker (James McCarthy) were both commissioned by the Chorus, with generous help from individual sponsors. The works were premiered in London’s Barbican Hall and were acclaimed by audiences and critics alike, drawn into them by the emotional power and beauty of the music and words. Their universal themes of love, science, loneliness and social injustice resonate with audiences as they are strikingly relevant to the times in which we live today. Codebreaker received its US premiere in April 2017.